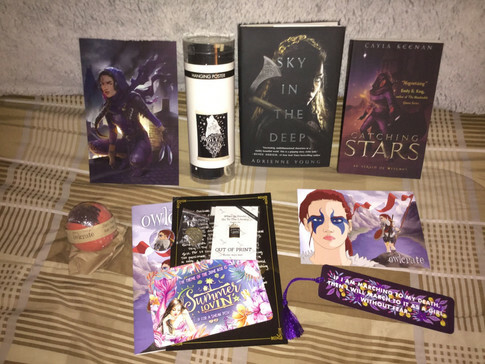 So it's going up late yet again, but today I have the May and June Owlcrate boxes for 2018! For the May Owlcrate box, the theme was Fight Like a Girl. To start off we have an enamel pin that has "When in doubt go to the library on it" and a pin that says "Qnd Eldr. Breathe Fire." on it, which is from the book of the month. Next, we have a Children of Blood and Bone inspired bath bomb called Zelie's Magic Bath Bomb. There's a bookmark that says "If I am marching to my death then I will march to it as a girl without fear" on it and is from A Flame in the Mist. The last two items are an art print of Inej from Six of Crows, and a canvas banner that has "Remember you are a wolf and cannot be caged" on it, which is from A Court of Mist and Fury. The book of the month was Sky in the Deep by Adrienne Young, and this box also included a second book, Catching Stars, by Cayla Keenan. 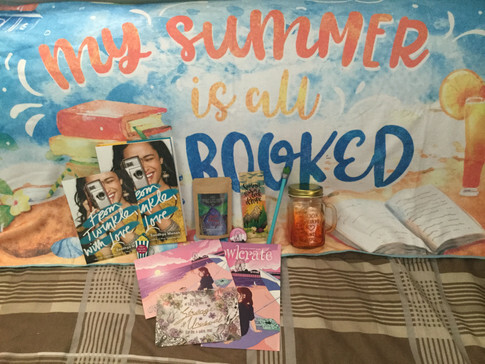 The theme of the June box was Summer Lovin' and it was filled with great things. To start we have a tea from Riddle's Tea Shoppe called Apple Picking at Night and also a mason jar mug to drink it from. Next, we have a little cactus pen that says "Sunny Day" on it, and a bookmark inspired by Aristotle and Dante Discover the Secrets of the Universe (my favorite book!) that says "Summer was a book of hope". Lastly, we have a microfiber beach towel that says "My summer is all booked" on it. The book of this month was From Twinkle, with Love by Sandhya Menon. Overall these were two pretty awesome boxes and I can't wait to see what's in the next one!